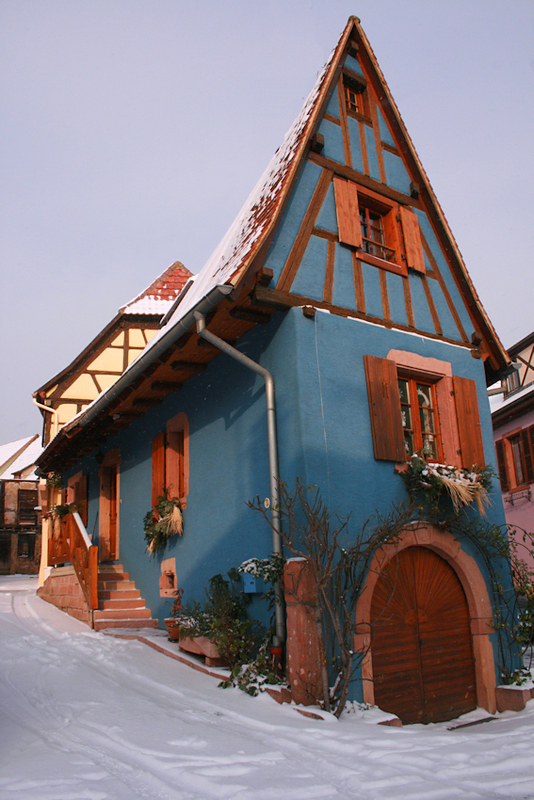 I’m missing being in Alsace at this time of year. Haven’t been in December since the Great European Freeze in 2009. The last day, the Friday before Christmas, was cold, piercingly cold. We went up to the national military cemetery at Sigolsheim, a hill where many of the French dead of the fighting in the Colmar Gap (1944) are buried, and admired the spectacular views. It was bitingly raw. I had thought it was glacial at the Col de la Schlucht the previous day: -10°, which was so cold that the metal on my glasses burned my face and I had to remove all my earrings because they felt like ice needles. But that was in deep snow and you expect it to be cold. Sigolsheim felt colder, maybe because there was a wind. I abandoned the plan to go to the marché de Noël at the nearby village of Kaysersberg; hot chocolate and a delectable cake in Ribeauvillé was more appealing. That evening after dinner we went for a late night stroll round the medieval ramparts of St-Hippolyte. It was a clear sky and you could see thousands of stars, and across the Rhine plain to the lights of the Black Forest. At 3 am the weather was clear. I looked out of the window at 5 am and……. Blizzard. Four inches of snow and more falling. Now what? As soon as reception opened I went down and talked to the lovely owner of the hotel. She rearranged her bookings a bit and said we could have the room for another night. I phoned the onwards b&b to cancel, and he told me that he had already had other cancellations because of the snow in north west France and because the Tunnel was closed. What? Why? Because there were five trains stuck in it… I can’t describe how my heart sank. At that point it wasn’t clear that the breakdowns were Eurostar, not Eurotunnel, and we were booked on Eurotunnel the next day. Saturday passed in a blur of tramping round the village in the biting cold, mulling things over in a cafe, taking photos, trying to get information on which to make a plan. Thank goodness for WiFi. At least we could get live updates in comfort. Buying tarte à l’oignon in the village shop which was crowded with happy people ordering festive delicacies felt so miserable. They were in the comfort of their own patch, pretty for Christmas. In the afternoon we decided to check out the Route Nationale, which was open. We cautiously slid our way to Ribeauvillé for coffee and saw that the temperature outside the car was minus 14°C. By evening it was -16°. We talked to staff at the hotel, who were very helpful and thoughtful, and found that arriving guests had been able to use the autoroute. It’s obligatory for the autoroute to be kept open and they salt them at 02.00h so they will be clear by 04.00h. We also discovered that the snow predicted for 03.00h was actually going to be in the afternoon. That gave us a window. If there was no overnight snow, we were going to throw everything in the car and race as far west as we could. We needed to get across the Vosges as a priority. We looked at the cameras on the M20 at 01.00h and the traffic in Kent was moving. I was very frightened indeed by the possibilities: what if there’s an accident, a hold up; sitting in the car in -16° is enough to give you exposure. What if, what if, what if. I couldn’t sleep. Absolutely amazingly, we pulled into Eurotunnel just in time for the crossing we’d booked. No hold ups, no queues, no hassles. Drive in, drive on. We hadn’t had breakfast or lunch, just eaten chocolate in the car, and this was about 15.30h, but we were safely there. Again, no problems in Kent, though we drove past 30 miles of stacked trucks on the Dover-bound carriageway. Breakfast was fish and chips at Toddington Services at 17.30! Because I was so tense and scared, and the unknowns were so great, I feel fairly stressed even now, recalling. The adrenalin takes over at the time. It felt like a miracle to be sitting in the warm, in my own home, just before Christmas, exactly as planned. There was a very real possibility that it wouldn’t happen.